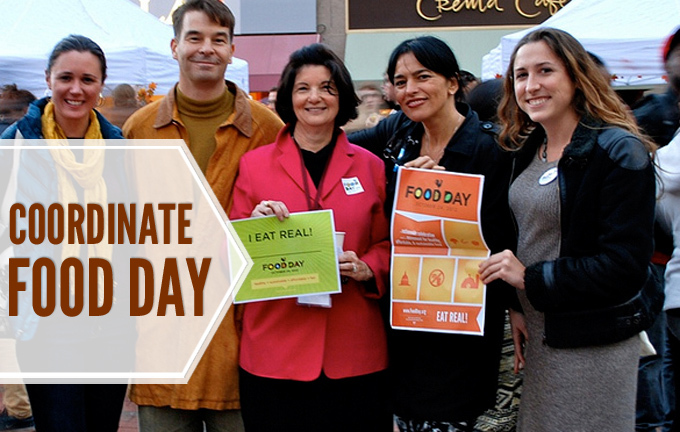 Food Day is a year-round nationwide celebration of and movement toward more healthy, affordable, and sustainable food culminating in a day of action on October 24 every year. Created by the nonprofit Center for Science in the Public Interest and driven by a diverse coalition of food movement leaders and citizens, Food Day aims to bring us closer to a food system with “real food” that is produced with care for the environment, animals and the women and men who grow, harvest and serve it.Sign up to host an event or coordinate for your area, and connect with coordinators and events at www.foodday.org/get_involved. Events and activities can be anything from a healthy potluck, a local food taste test, farmers market walk-over, or movie screening, to a campus conference on policy, or a district-wide challenge to eliminate junk food from schools. The goal is to educate, raise awareness, and advocate for improvements in the food system. See the 2012 Campaign Report, featuring 3,200 events that took place in all 50 states, for more ideas. Joining the Food Day movement may also mean taking small steps over the year to introduce more fruits and veggies into your diet, getting involved in your local food policy council, or teaching children to make healthy recipes. 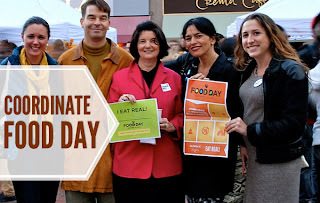 The website offers organizing guides for general organizing, schools, campuses, faith communities, film screenings, and more at www.foodday.org/resources. They also offer a limited amount of free printed promotional materials to event hosts.